Delaware City Schools inducted five individuals into the Distinguished Alumni Hall of Fame on Friday evening. This year’s recipients were Jacob Edwards (2007), Paul Gaus (1967), Terry Johnson (1952, awarded posthumously), Stephen Reed (1966), and Ezra Vogel (1947). These individuals join 126 other alumni previously inducted into the DCS Hall of Fame. Jake Edwards was honored for his athletic achievements in cross country and track. He holds many records at Hayes High School and competed at The Ohio State University where he also holds the indoor track record in the mile. He has twice broken the 4-minute mile during competition. Edwards continues to compete at the national level in indoor, outdoor, and road racing. He hopes to qualify for the Olympic trials in 2020. Paul Gaus retired after serving 31 years as a chemistry professor at The College of Wooster and served as a visiting professor at several universities during sabbaticals. He co-authored a best selling chemistry textbook and published numerous articles in prestigious journals. As a second career, Gaus has written nine Amish mystery novels set in Holmes County. Terry Johnson was a four-sport athlete at Willis High School, earning 12 varsity letters. He was the quarterback of the famed 1951 undefeated football team and earned numerous accolades in basketball, baseball, and golf. After high school he continued to play in prominent golf tournaments. Johnson passed away in 1999. Stephen Reed is a renowned veterinary internal medicine specialist, specializing in equine neurological diseases. Reed has authored and co-authored more than 200 publications and co-edited two textbooks which are widely used in veterinary schools. Reed consults with researchers around the world on issues relating to equine diseases and he mentors young veterinarians in training. Ezra Vogel is a retired Harvard professor. Vogel served as the director of Harvard’s East Asian Research Center and was the National Intelligence Officer for East Asia at The National Intelligence Council. He served as a consultant on East Asian policy. Vogel has authored several books, with two becoming best sellers. At age 87, he is working on a new book. Inductees addressed a student audience on Friday afternoon, encouraging students to dream big, find their passion, rely on family and friends, and reinvent themselves as necessary to do what they love. They were formally inducted into the Hall of Fame during an evening ceremony and recognized at halftime of the Hayes football game. The Delaware City Schools Distinguished Alumni Hall of Fame was established to recognize and honor those graduates, who through their exemplary actions and achievements, reflect positively on the Delaware City Schools. This now combined Hall of Fame recognizes alumni who have excelled in career achievement, athletics, and the performing and visual arts. 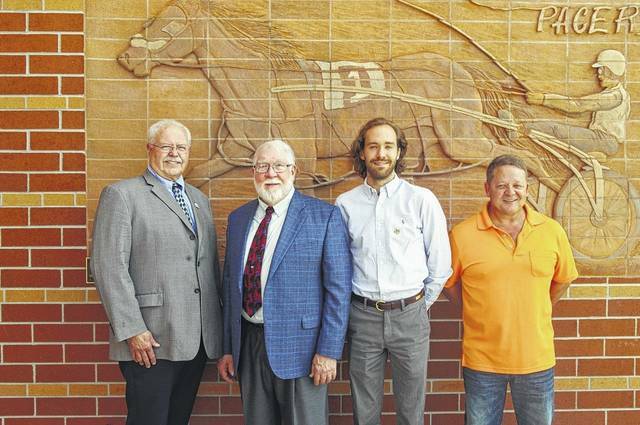 Five people were inducted into the Delaware City School District’s Distinguished Alumni Hall of Fame. From left to right are Stephen Reed, Paul Gaus, Jake Edwards, and Tom Johnson, who was representing his father Terry Johnson. Ezra Vogel was unable to attend.